Here we all are back at Chez KP safe and sound. The Bread Winner and I had a lovely weekend of togetherness in Sydney and the Ankle Biters had a terrific time being spoilt by their grandparents. I’m pleased to report that Son and Heir missed me. It’s nice to feel loved. Lil Miss, on the other hand, saw us walk in and her instant response was “Daddy! Me missed you! Mummy! Me want some of your boo boo”. Yep, I’m just the house cow. Sigh. I’m still little discombobulated. It’s always such a drag getting home and dealing with the flurry of unpacking, laundry, making lunches, getting clothes and bags rady for work, kinder, creche and so on. I did as much as I could last night but I was still scrambling when I got home from work today. The garden needs my attention and I hope to get to that tomorrow. In the meantime, I thought I’d better try and normalise my routine and that includes posting here! So, Jen asked in my comments for my mayonnaise recipe and I thought I’d also share tonight’s dinner. So here they are. I use the thermomix with the butterfly on speed 4 for this. A food processor or even a hand held whisk will work just as well. Place egg yolks in bowl with salt, cayenne, mustard and muscovado. Blend for 5 seconds or until well combined. Add oil a drop at a time, beating continuously (food processor running or TM running on speed 4) until thick and creamy. Add vinegar a drop at a time while still beating. Heat oil in large frypan. Place over lowest possible heat and add onions and cauliflower. 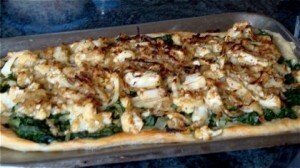 Roll out pastry, spread silverbeet over top and then cauliflower and onion mixture. Bake about 20 minutes or until pastry is puffed and golden. That looks so yummy…When are you coming to Canada to cook for me?? I’m definitely putting that mayo recipe on file. It looks truly out of this world! You won’t regret it Docwitch. Well actually you might if you develop my penchant for eating from the jar by the spoonful.